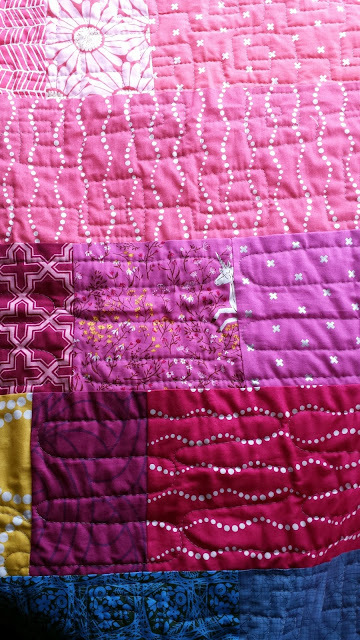 Improvisation is my favorite piecing method; I love the freedom of creating totally unique quilts every time. There are many different ways to improvise but my preferred method is "brick by brick improvisation," my version of improvisation with intent or a plan. What came out of another experiment in this medium is a quilt I'm quite taken by. See the unicorn? That just happened. Because improv! When I pulled colors for the Meadow workshop with Lizzy House last summer, I realized I loved them a whole lot. Like, more than one quilt's worth. I mostly cut strips from half yards and fat quarters for the Meadow quilt, and I had significant chunks left over. Instead of throwing them into my scrap bins, I sewed them together almost immediately! That's one way to cut down on scraps, right? 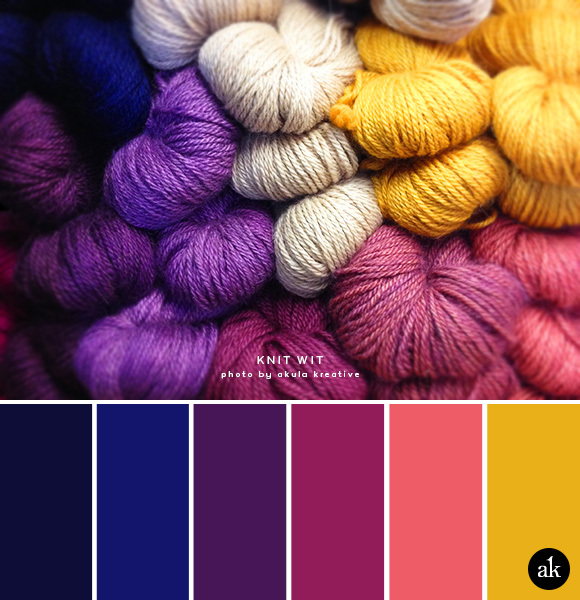 Here's the color scheme I chose for my Meadow quilt, from akula kreative. I arranged the colors in a general gradient fashion, different from the one in the image above. I have lots of tips and tricks for achieving this look; it's an exercise in both freedom and restraint. In fact, I tried to mimic mountains in sunset (hence the name) - do you see it? Of course, I thoroughly enjoyed quilting on my domestic machine. Whenever I make a quilt I yearn to quilt something different (much like Spring Wind recently), so many of these motifs were new-to-me. I can't say exactly what prompted each one, but I do love a good curvy line (above) and quilting all kinds of rainbows happens to be another personal favorite past time (below). My Pinterest board for FMQ usually serves as a great starting point. 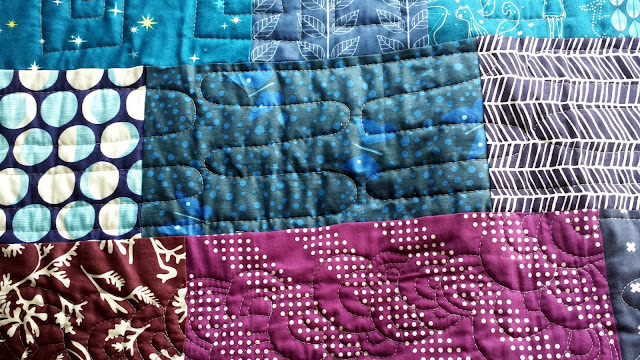 I quilted each color in a different motif to create another layer of interest. That Aurifil thread #2605 (Medium Gray) was just enough of a pop on this very saturated color scheme. This quilt will serve as a sample for my newest workshop, the Landscape Quilt, coming soon to a quilt guild or shop near you! This kind of quilt can be made with any color scheme or from any photo, and would be a perfect gift or family quilt. Stay tuned for more info this weekend - I am SO EXCITED! 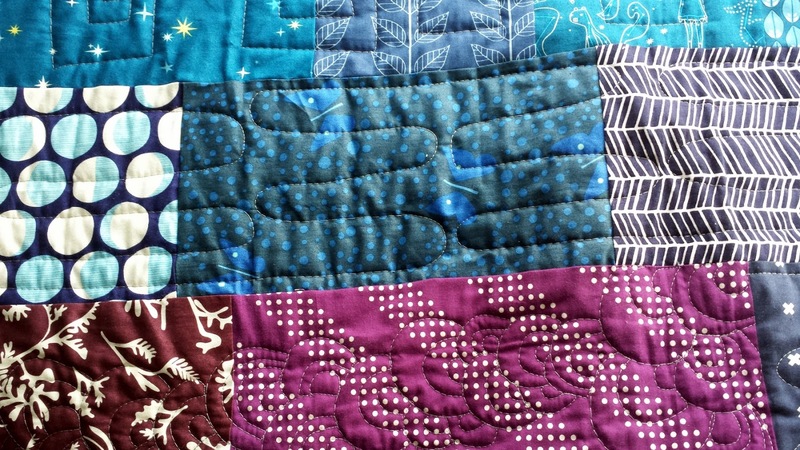 The sun was quite bright, but it always so beautifully illuminates quilting. haha the picture of you peeking around your arm is just like the unicorn peeking on your quilt! 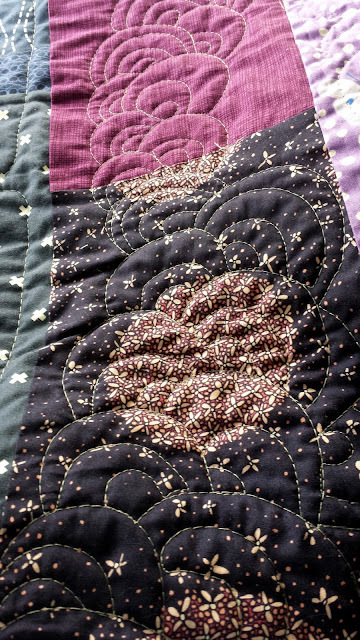 I love how each row has different quilting, that would be such a fun way to play with new motifs and not get bored (like quilting 7 hours of swirl, ah mah gahd). I love your color and block placement in this quilt, especially the yellows! I am not good at using yellow. I do love your color inspiration picture...and the colors! I love improv but have never tried the 'brick by brick' method. Thanks for the inspiration! Gorgeous quilt and quilting...I'm in awe! That is such a fun quilt. I really love all the different fabrics and your quilting is just so much fun! Great outtakes! :-). Thank you for linking up at TGIFF! Lovely and colourful - what a great way to use up some very cool fabrics! On the outtake: you look great! Your hubby either has a great sense of humor or thinks you are beautiful. What a winner! Lovely finish! Perfect color inspiration.